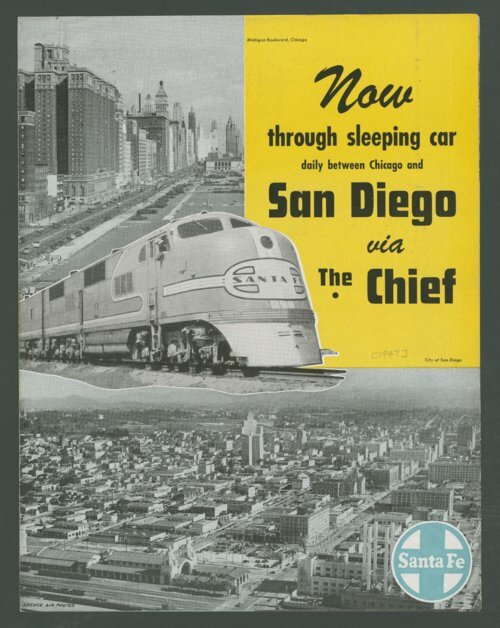 This brochure published by the Atchison, Topeka & Santa Fe Railway Company is promoting travelers to take the passenger train the "Chief" and enjoy the new through sleeping car services to and from San Diego, California. Inside the publication there are several images of tourist attractions to visit while in San Diego and a condensed schedule of the "Chief's" westbound and eastbound trains. On the backside of the brochure travelers are encouraged to include the passenger train the "San Diego" in their next trip to California. San Diego via "The Chief"